Wedding car decoration ideas that you can use for your marriage car decoration! Wedding car decoration in which the bride goes to her new home is an indispensable part of every bidai ceremony. Grooms these days either rent out a luxury car or use their own car to take the bride to his home. Depending on what your style is, you can choose a marriage car decoration that complements the colour as well as the type of car. To give you some wedding car decoration ideas for your big day, here’s a list of different styles of wedding car decoration that you can show the florist or a decorator as an inspiration! If your bride-to-be is a pink lover, then this wedding car design with pink lilies, big pink ribbons and marriage rings figure on the top is just too perfect for your big day! If you are not too big on wedding car decoration and want something simple and tasteful, then an oversized net bow with a flower bouquet on the trunk is an elegant option to consider for your marriage car decoration. Are you too fancy to stick to basic car flower decoration? Well, you can take your wedding car decoration to another level by adding these cute figurines on the car top or bonnet along with other car flower decoration. It’s true when they say that nothing beats simplicity! If you are looking for some elegant wedding car decoration inspiration, then this single bouquet and ribbon on the bonnet is something you can surely consider! Make your Just Married car decoration look dreamy and right out of a vintage Hollywood movie by decorating it with balloons! Skip the flowers, use ribbons if you wish and have lots and lots of balloons hanging out of the car. Tip: Use a mix of both your favourite colours for the balloons. If you wish to keep your wedding car decoration simple and graceful, then a minimal floral bouquet with net and ribbons is all you need to make it look stunning! Rent a vintage car, add a pair of lips on the bonnet, some eyelashes on the headlights and even a crown if you want on the car top to make your marriage car decoration look like a beautiful princess! Apt to take your new bride to her new home, right? This Indian wedding car decoration with red beaded malas surely does give major ethnic feels! 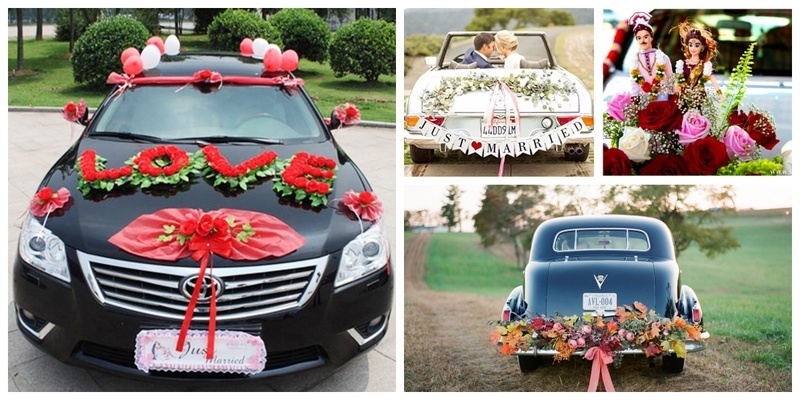 This just married car decoration is perfect for couples who want to ditch the cliched floral wedding car decoration. If your bride loves all things cute, then this wedding car decoration is something that will definitely catch her fancy. It has teddies, flowers, ribbons, bows and everything adorable! Spelling out the word ‘LOVE’ with the wedding car decoration on the bonnet is a great idea! You can even add initials of the both of you with flowers for your own personal twist to this marriage car decoration. This simple wedding car decoration of floral arrangement at the bottom of the car trunk is elegant and minimalistic at one! Such decorations are perfect for vintage cars or those with rounded trunks! The ‘Just Married’ tag at the back of the wedding car decoration with empty tin cans is a very western concept. However, it seems to be picking up at Indian weddings too. If you are planning to have your wedding car decoration similarly, then these Just married car decorations are definitely something you can take inspiration from!